Stayed for two weeks. Very clean, gates for young children. Great kayaking, boating, swimming. Beach, boat dock, very quiet and restful. 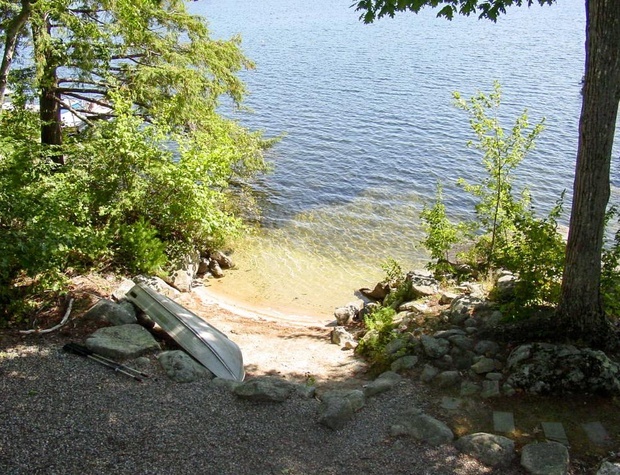 We love the location, we love the house, we love the dock and beach and of course Lake Winni!! Very good location. Plenty of room for our family. Everything was in working order. Well maintained property. Ideal for family with children. This house was perfect for our family vacation. I have been wanting to do a lake vacation with our adult children and grandchildren for a couple years and this experience was wonderful!!! The beach area, although small, was perfect for our grandchildren ages 21/2 and 7 months. We had plenty of room both inside and out for everyone to enjoy. We could be at the water while children were napping and enough space so we were not on top of each other. We thoroughly enjoyed fire pit area, outside deck area and dock. Got a lot of use of rowboat, would have liked kayak/paddle boards on site, we did rent paddle boards, which were delivered, so had a lot of water fun!! We wanted a quiet spot where we could relax and this place fit the billl!! We liked that it was a quieter part of lake, without power boats too close. Area restaurants, etc were still accessible. Appreciated the built in gate at top of stairs as we had 2 small children. The kitchen was very well stocked with everything we needed to prepare meals(really appreciated the electric tea kettle). Everyone had a great time and we would consider going back again!!! We had a most enjoyable vacation at this home. We have stayed in many waterfront spots on this lake and this home satisfied all our needs and wishes. Plenty of room for our family and very comfortable accommodations. Easily accommodated 4 adults and 5 children.Very clean and comfortable.Dock accommodated 22 foot boat.Large but quiet cove;not a lot of boat traffic. Great for young kids to kayak, swim and jump off dock.Southeastern view.Relatively shady unless you are on the dock or in the water. This was one of the best vacation rentals. The house was clean and in a great location on the lake. There is nothing like waking up in the morning, having your cup off coffee on the dock and enjoying the incredible views. My wife and I will definitely be back. Thanks bayside rentals for you help finding us this property!! !